LSO Discovery runs early years workshops both at our Music Education Centre, LSO St Luke’s, and at children’s centres and nurseries in Islington and Hackney. Led by our Early Years music specialist, Vanessa King, and supported by LSO players, the workshops are interactive, musically informative, and above all, a lot of fun. 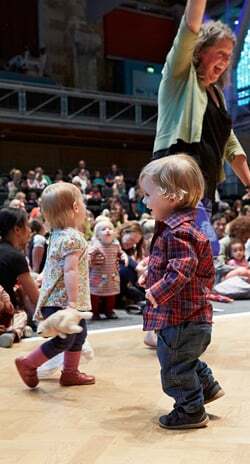 We also run termly Under-5s Concerts at LSO St Luke’s. These events are a lovely opportunity for these local children to be part of a musical storytelling concert which brings lots of different nursery groups together. We believe that exposing children to music from a very young age can help them to build in confidence and learn to express themselves in a creative way. Music is a tool which strengthens relationships between children and their parents or carers and our sessions are designed to equip adults with the tools and confidence to use music themselves in the home or the nursery. During our early years sessions, children are immersed in a wide variety of musical activities which bring many benefits including helping to develop social, language, listening and motor skills, all key areas of the Early Years Foundation Stage curriculum. Musical activities are often cross-curricular in nature and can be linked to other subject areas including literacy, science and maths. Counting songs, for example, can help to develop children’s knowledge of numbers and sequences, while hearing live instruments helps them to begin to understand the basic principles of sound production. Musical activities are repeated within and between sessions to give the children time to enable them to grow in confidence and as a result become more participatory. The sessions have a familiar structure, with a calm beginning and end, but there is also opportunity in every session for free play and movement. As well as having the opportunity to be active through singing, playing and movement, the children are also encouraged to listen attentively at points during the sessions to help develop their concentration as well as their listening skills. For many children the opportunity to hear and see orchestral instruments in the workshops is a new and exciting experience, particularly the more unusual instruments like the gigantic double bass! LSO players enhance Vanessa’s sessions by providing music accompaniment for games and songs, as well as interacting directly with the children through music. LSO Early Years Outreach projects are generously supported by The Ashla Charitable Trust, Finsbury Educational Foundation, Mrs Margaret Guido's Charitable Trust, Rothschild Charities Committee and LSO Friends. 'In my many years of working with young children I have found that music is such a joyful inclusive medium which everyone can join in with, on their own level. It can greatly enrich the development of each child and their understanding of the world around them. Music is such an important part of our lives and is very natural to us all. Children especially love to sing and dance. Everyone responds to music, it nurtures every part of us, makes us happy, makes us sad, excites us, calms us down and enables us to access our emotions in a healthy way. SOCIAL SKILLS - music-making encourages sharing, turn-taking, communicating and ultimately boosts children’s confidence. LANGUAGE DEVELOPMENT - songs are sung at a slower pace than speech often with much word repetition, facilitating language development. LISTENING SKILLS - in this busy world just stopping and listening is hugely beneficial, developing concentration and encouraging creativity and imagination. MOTOR SKILLS - the child’s response to music through movement helps develop co-ordination.